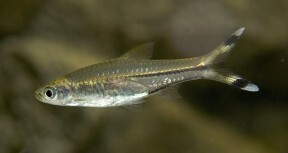 Adult, probably male, specimen of Rasbora trilineata. This floodplain of the Bekee River in western Thailand is a natural habitat of R. trilineata. 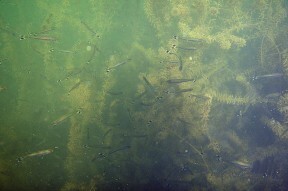 School of R. trilineata in the upper Khwae Noi (River Kwai), western Thailand. This species is normally available at a young age and relatively small size. R. trilineata occurs sympatrically with R. borapetensis in the upper Khwae Noi. Native to the Chao Phraya and lower Mekong river basins in Laos, Thailand and Cambodia and is widespread in Peninsular Malaysia with its distribution also extending into the Greater Sunda Islands of Sumatra and Borneo. It may be restricted to eastern Sumatra and south and western parts of Borneo including the Malaysian state of Sarawak and Indonesian province of West Kalimantan (Kalimantan Barat). At any rate specific occurences are far too many to list here. Wild caught fish are increasingly hard to come by in the hobby as it is being produced commercially in several countries. Clearly an adaptable fish as it has been collected various types of habitat including swiftly-flowing forest hill streams with substrates of boulders, smaller stones, sand or gravel and more sluggish blackwaters associated with areas of ancient peat swamp forest which are typically full of fallen leaves, twigs and branches. In the former the water tends to be clear with a pH between 6.5 and 7.5 whereas in the latter it is characteristically stained brown due to the release of tannins and other chemicals released by decomposing organic matter, very soft (negligible hardness) and acidic (pH 4.0 – 6.0). Such forested environments are often dimly-lit due to the tree canopy above. It also inhabits permanent bodies of water including many reservoirs and lakes and is known to move into flooded areas during the wet season across some of its range. Fully-grown at around 6″/15cm which is significant as it is usually sold at a much smaller size. It will also do well in a tank set up to recreate a peat swamp–type environment with dim lighting, roots and branches, leaf litter and real peat fibre added to the filter or mixed into the substrate. You could also add aquatic plant species that can survive under such conditions such as Microsorum pteropus (Java fern), Vesicularia dubyana (Java moss) and Cryptocorynes. In either situation the tank must have a very tightly-fitting cover as this species is a surface-dweller, an accomplished jumper and can escape through the tiniest of gaps. 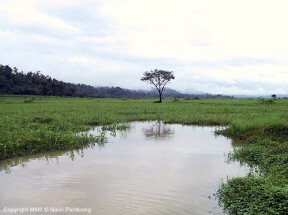 Like many other species that hail from such pristine natural environments it is intolerant to the accumulation of organic wastes and requires spotless water at all times in order to thrive. It may be wise to ask about the origin of your fish before purchase as populations from flowing waters may require acclimatisation to more acidic, less-oxygenated conditions and vice versa. 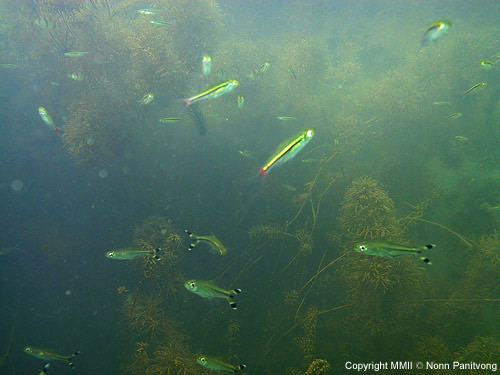 The widely-available captive-bred fish are likely to be adaptable to both sets of conditions but wild fish might be more delicate. This species also seems to react badly if introduced to the aquarium too quickly so try to acclimatise it over a couple of hours if possible. pH: 5.0 – 8.0 depending on the origin of the fish but somewhere between 6.5 – 7.5 usually proves ideal in the aquarium. According to stomach analyses of wild specimens this species feeds mainly on invertebrates both aquatic and terrestrial, particularly insects. In the aquarium it will accept dried foods of a suitable size but should not be fed these exclusively. Daily meals of small live and frozen fare such as Daphnia, Artemia and suchlike will result in the best colouration and encourage the fish to come into breeding condition. This species is very peaceful indeed making it an ideal resident of the larger, well-furnished community tank. As it places no special demands in terms of water chemistry it can be combined with many of the most popular fish in the hobby including other cyprinids as well as tetras, livebearers, rainbowfish, anabantoids, catfish and loaches. As always when selecting a compatible community of fish proper research is essential and its adult size must be a consideration. A community based around one of its native countries or river basins would also make a worthwhile project with some interesting alternatives. For example in the Endau river drainage, Peninsular Malaysia sympatric species include Barbonymus schwanenfeldii, Crossocheilus oblongus, C. langei, Mystacoleucus marginatus, Puntius lateristriga, P. banksi, P. johorensis plus various members of Rasbora, Cyclocheilichthys, Pangio, Homaloptera and Nemachelius. This is one of the easier members of the genus to breed and like most cyprinids is an egg-scattering, continuous spawner that exhibits no parental care. That is to say when the fish are in good condition they will spawn often and in a densely-planted, mature aquarium it is possible that small numbers of fry may start to appear without human intervention. However if you want to increase the yield of fry a slightly more controlled approach is required. The adult group can still be conditioned together but one or more long, shallow, say 48″ x 12″ x 12″/120cm x 30cm x 30cm/113 litre containers should also be set up and half-filled with water. These should be very dimly lit and the base covered with some kind of mesh of a large enough grade so that the eggs can fall through it but small enough so that the adults cannot reach them. The widely available plastic ‘grass’-type matting can also be used and works very well for other species. The water itself should be of slightly acidic to neutral pH with a temperature towards the upper end of the range suggested above. An internal power filter can be added initially and this should be positioned so that the flow is directed down the full length of the tank. This popular species is also known as the ‘three-lined’ rasbora and provided a large enough tank is available it is an excellent choice for those new to the hobby. The ‘scissortail’ moniker is derived from the characteristic twitching motion of the caudal fin when the fish is at rest. It can be distinguished from the similar R. caudimaculata by lacking red colouration in the caudal fin and from R. spilocerca by its much larger size. 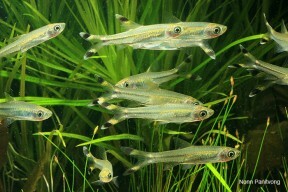 Several geographical forms appear to exist as some wild populations exhibit varying degrees of yellow pigmentation in the caudal fin.